This collection of short prayers from different religions around the world is presented with intricate illustrations showing related settings and people. 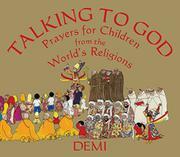 Over her extensive career, author/illustrator Demi has profiled many individual religious leaders in well-received biographies for children. With this collection, she introduces groups of short, often well-known prayers representative of many of the world’s major religions, including Christianity, Judaism, Islam, Hinduism, and Buddhism. Single prayers are included from Taoism, Shintoism, the Lakota people, and the Luba people of central Africa. The illustration for each prayer includes a group of representative humans, such as Buddhist monks and children praying at a Buddhist temple or a group of Jews praying at the Western Wall in Jerusalem. Demi’s highly detailed illustrations with signature touches of gold are intriguing and well-researched, including people of many ethnicities and ages. An introduction from the author details her inclusive view of the common threads that underlie all these different religious traditions as well as her goal of fostering “tolerance and respect” through the combination of her choice of prayers and visual interpretations. Two concluding pages give specific notes on the prayers and on related illustrations.